Status: Uncommon regular spring and fall migrant statewide. Rare casual breeder west. Rare casual summer visitor statewide. Documentation: Specimen: UNSM ZM14607, Oct 1938 North Platte, Lincoln Co.
Taxonomy: Most authors recognize four subspecies world-wide; two of these occur in North America: carolinensis in the United States and Canada, and ridgwayi of Cuba, Belize, and the Bahamas (Bierregaard et al 2016). Ospreys in Australasia, subspecies P. h. cristatus, have been raised to species status as Eastern Osprey based on genetic and morphological differences (Gill and Donsker 2017, Christidis and Boles 2008); this change would not affect North American taxonomy unless the proposal by Wink et al (2004) to raise all four subspecies to species level is adopted. AOS has not adopted the change; we follow AOS. Nebraska birds are carolinensis. Changes Since 2000: Osprey has expanded into Nebraska as a breeder beginning in 2008. This pattern is part of a general increase observed in many areas of United States in recent years (Comments). Arrival is generally in early Apr and numbers peak in late Apr. Earlier reports are of singles at Fontenelle Forest, Sarpy Co 5 Mar 2009, at Offutt Base Lake, Sarpy Co 13 Mar 2015, and in Douglas Co 17 Mar 2017. A later report was of one in Dakota Co 11 Jun 2016. Numbers wane quickly after mid-May. High counts: 7 at Branched Oak Lake, Lancaster Co 27 Apr 1995, 7 at Pawnee Lake, Lancaster Co 26 Apr 2006, and 7 in Lancaster Co 19 Apr 2012. Summer: According to Bruner et al (1904), Osprey formerly bred at least once along the Missouri River near Rockport on the Washington-Douglas Cos boundary (Ducey 1988), but no further details are available. Despite successful hacking programs in Iowa since 1997 by the Iowa Department of Natural Resources and since 2003 by the South Dakota Game, Fish, and Parks Department, there were no known nesting attempts for Osprey in Nebraska until 2008. No Osprey hacking programs have been initiated in Nebraska. The first modern nesting attempt by Ospreys in Nebraska was at Winters Creek Lake, Scotts Bluff Co in 2008 and resulted from natural expansion into the state from Wyoming along the North Platte River into Scotts Bluff Co. The initial nesting attempt and another at the same site in 2009 and several additional attempts at other nest sites in Scotts Bluff County were all unsuccessful through 2014. The primary cause of failure was destruction from severe storms. In addition, a pair building a nest on a power pole at the Riverview (formerly Riverside) site a mile west of Scottsbluff 15 Apr 2011 apparently was electrocuted before 1 May; the local power company then proceeded to install a 65-foot high pole and platform, and a new pair was present late in the reporting period. This platform was in use again in 2012, with 2 young in the nest 19 Jun, but a severe hail storm appeared to have ended the attempt. Finally, in 2015, breeding success was achieved in Nebraska at four sites, all of which had had several years of failure, three in Scotts Bluff Co and one in Keith Co. 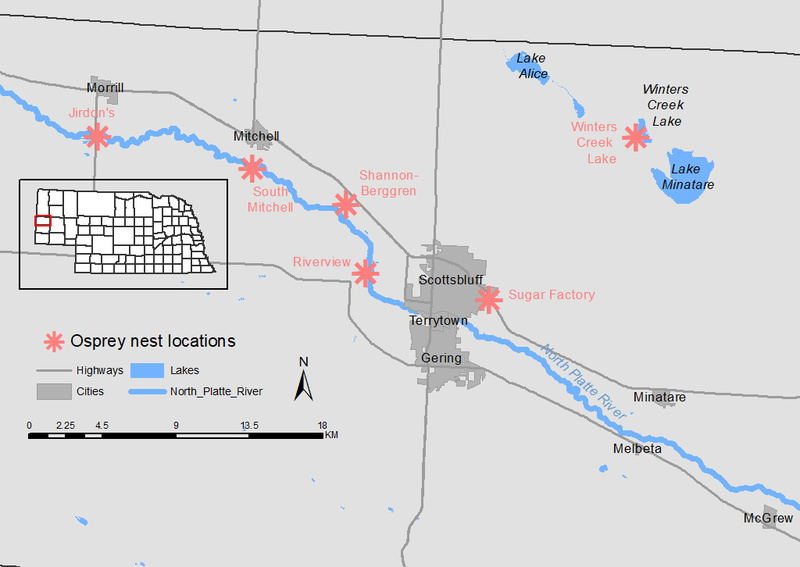 In Scotts Bluff Co, a nest near the Western Sugar Factory contained three juveniles 25 Jul 2015 that were near fledging, and a nest on a platform at Riverview had two young a little younger than the sugar factory site the same day. Each of these Scottsbluff nests had fledged three young by mid-Aug. A third site, on Shannon Road, near Mitchell, had young “a few weeks” prior to 25 Jul, but no birds were present on that date; it is possible that these young also fledged, but evidence is lacking. In 2016, these three Scotts Bluff Co locations were occupied by 13 Apr and incubation of eggs was under way at least at one; two of the nests each fledged two young, and the Shannon-Berggren nest was unsuccessful due to high winds. The power company built a nest platform the same year nearby on Berggren Road. In 2017 the Sugar Factory, Riverview, and Shannon-Berggren nests fledged young, and an adult was incubating at Winters Creek Lake 11 Jun. A new nest site was located in Scotts Bluff Co in 2017, at the former Jirdon’s Feedlot south of Morrill near the North Platte River; incubation was underway 11 Jun, but the nest was abandoned in early Jul (Appendix, below). All five locations were active with young by 22 Jul in 2018 and the Shannon-Berggren nest had fledged young by 1 Aug (Table 1). Similar weather events affected attempts in Keith Co; a pair was building a nest on a platform erected by Midwest Electric on Nebraska Public Power District land near Keystone, Keith Co 21 Apr-1 May 2011; this attempt and one the following year were unsuccessful, however. In 2015, the Keystone platform contained a juvenile 22 Jul, and another juvenile was seen flying in the area 18 Jul. In 2016, this site had three nearly-fledged young 8 and 15 Jul 2016, and in 2017, three young about 5-6 weeks old were in the nest 28 Jun. In the northeast, there had been indications of Ospreys hacked in South Dakota making nesting attempts. None were successful until 2017, when a pair was nesting on a tower at Omaha Public Power District’s (OPPD) Fort Calhoun station, Washington Co 21 Jun; nesting apparently had occurred there five years earlier based on information provided by OPPD. Previously, one was building a nest on a power pole at Powder Creek Reservoir, Dixon Co 13 May 2006, but the outcome, or whether indeed two birds were present, is unknown. A bird hacked from the South Dakota side of Lewis and Clark Lake, Knox Co was in southwest Sarpy Co 22-28 Jul 2009, indicative of wandering by a presumed immature non-breeder. At Summit Lake, Burt Co, a single bird was nest-building on a tall cell phone tower 6 Jun 2013; it was carrying a band indicating it was a bird hacked in South Dakota in 2008. Three birds were at this site 2 May 2014, one with a blue marker indicative of one of the 2013 birds returning to the site. No outcome was reported for either year, although one was seen at the site 29 Apr 2016. Table 1. Modern Osprey nest sites, county where located, years active and years successful. There are about 55 reports in the period 10 Jun-7 Aug, distributed statewide. Most are from large reservoirs and probably represent unpaired birds prospecting for mates and nest sites. Juvenile Ospreys do not leave their wintering areas until their second spring and many stay on until their third spring (Bierregaard et al 2016). Migration is evident beginning in late Aug and peaks in mid- to late Sep. There are earlier reports of four on 31 Jul 2016 at Fort Robinson SHP, Dawes Co and 6 Aug 2017 Sarpy Co, and later reports 3 Dec 1988 Lancaster Co, 3 Dec 2017 Holmes Lake, Lincoln, 5 Dec 2016 Lancaster Co, 11 Dec 1991 Scotts Bluff Co, and 19 Dec 2010 Scotts Bluff Co. One counted on the Grand Island CBC 18 Dec 2004 was an injured bird found near Doniphan in Hall Co; it was recovered and taken to a rehabilitator but died a few weeks later. There are scattered additional reports into late Dec, Jan, and Feb, but none are documented and some, if not all, are likely the result of identification errors. High counts: 26 at Lake McConaughy, Keith Co 3 Oct 1998, 9 in Lancaster Co 10 Sep 1995, and 9 at Lake McConaughy 17 Sep. Comments: Since 1990, breeding numbers have increased 50-100% in many areas of the United States, likely in response to increased habitat (e.g. reservoirs and other impoundments), availability of nesting platforms and other artificial nesting sites, ability of this species to habituate to human activity, and its broad diet (Bierregaard et al 2016). Ospreys are slowly increasing as a breeding species in Nebraska, and it is expected that they will continue to increase and expand their range. Increasing numbers of nesting Ospreys present a challenge since they have a propensity for constructing nests on power poles, which can create electrical shorts which may result in power disruptions and even fires. In order to discourage Ospreys from nesting on power poles, local electric utilities have erected nest platforms at sites where nest-building Ospreys have appeared, which in turn has likely promoted Osprey range expansion. Figure 1. Approximate locations (red asterisks) and names of known Osprey nest sites in Scottsbluff County, Nebraska, as of September 2018. Christidis, L. and E. Boles. 2008. Systematics and taxonomy of Australian birds. Collingwood, Australia: CSIRO PublChristidis, L., and E. Boles. 2008. Systematics and Taxonomy of Australian Birds. CSIRO Publishing, Collingwood, Australia. Wink, M., H. Sauer-Gurth, and H.-H. Witt. 2004. Phylogenetic differentiation of the Osprey Pandion haliaetus inferred from nucleotide sequences of the mitochondrial cytochrome b gene. Pages 511–516 in R.D. Chancellor and B.-U. Meyburg (Eds), Raptors worldwide. WWGBP/MME, Budapest, Hungary.